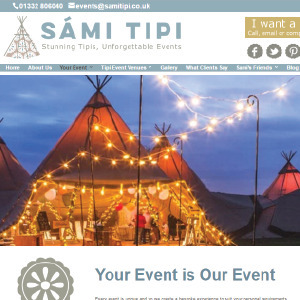 Sami Tipi is based in Derbyshire and is the UK’s leading tipi rental service. The bulk of what they do is provide tipis for weddings. They contacted us to rebuild their site to make it responsive and much easier to manage. Their key requirement was that they could use lots of images because what they do is very visual and good photography is key. Due to the system we provided they now have the ability to build unique pages designs without having to come back to us. The site has a video on the home page, blog, various social media integrations and a variety of interior page design.